Lock in a great price for A Casa Di Campa – rated 9.6 by recent guests! The stunning views across the mountains to the sea below. A very comfortable bed with an excellent nights sleep, a good location for a one night stay close to Bastia airport. Very pleasant and always helpful owners. Clean rooms, good location, lovely view. We had the perfect stay. 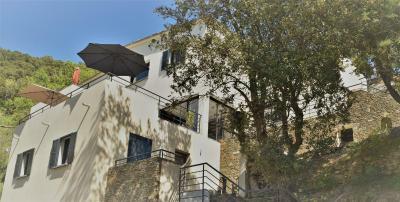 The location is strategic to visit the surrounding (Bastia, Patrimonio, saint Florent, etc). The owners are super nice and kind people. The breakfast on the terrace is lovely (amazing view). Strongly recommended. Very friendly owners, more than willing to give nice tips about site seeing as well diner location. A comfortable room (we were traveling with 2 adults, 1 child) with a big balcony with lovely sea view with your 'own' entrance in their house. Tasty homemade marmelade and honey at breakfast. Very good location for covering the northern part of Corsica. Many thanks to Michel and Hélène for their hospitality. The whole house was new and modern, we had a very nice view from the room, comfortable beds, good bathroom. The owners were friendly and gave us valuable tips for places to eat, beaches and in general places to visit and info about our itinerary. Je recommande vivement cette maison. Nous avions la chambre Nebbiu, les photos correspondents parfaitement à la réalité, Hélène et Michel ont été d'une extrême gentillesse et d'une grande discrétion. La chambre est superbe, literie confortable, propreté impeccable et la vue est splendide. Merci et surtout ne changez rien! Très bon accueil. Chambre parfaite très propre tout confort. Petit déjeuner très sympathique , très bonnes confitures maison. Magnifique vue sur la baie, Endroit calme et sécurisé. Très bon accueil. Très bon petit déjeuner. Located in Oletta, 6.8 mi from Bastia, A Casa Di Campa features free WiFi access and free private parking. The property is located 5.6 mi from Saint-Florent and its beaches. Enjoy a cup of coffee while looking out at the sea or mountain. All rooms are equipped with a private bathroom. Corte is 25 mi from A Casa Di Campa, while L’Île-Rousse is 21 mi away. The nearest airport is Bastia - Poretta Airport, 8.1 mi from the property. When would you like to stay at A Casa Di Campa? House Rules A Casa Di Campa takes special requests – add in the next step! Please inform A Casa Di Campa of your expected arrival time in advance. You can use the Special Requests box when booking, or contact the property directly using the contact details in your confirmation. We found the Casa difficult to find and had to resort to asking a local in the centre of village where the property was located, we were only a few hundred metres away but would have missed it even if we had carried on. Detailed instructions on how to reach the Casa would make it an even better place to stay.